Employer charges each worker $100 to live in containers. By Damien Chng. Last Saturday, 7th March 2009, Mohamed Ismail brought me and my two companions on a tour of his dormitory. Mohamed is a Bangladeshi worker with shipyard firm, Ocean Marine. We were taken to a place passed a forest where we had to fend off mosquitoes under a slight drizzle. The dormitory, as it turned out, was 200-metres from the nearest road. Situated in a clearing between two factories, fifteen cargo containers are stacked atop one another in pairs. One is used to support a water tank. 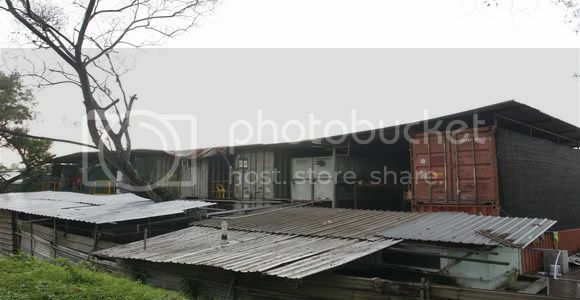 The only protection from the sun and the rain were zinc sheets placed on the roof of the containers. The compound is home to a mini migrant workers community – hidden from the buzz of civilization. Other than those from Ocean Marine, workers from various construction firms live here as well. Their kitchen, lavatories and shower area are made out of makeshift bricks, metal scaffolding and sheets of zinc. Shoes scatter across the ground, and laundry hangs from clotheslines along the sides of the rectangular vessel. Four double-decked beds are cramped inside the space of half a container. It measured no more than 3 meters by 2 meters. A fluorescent tube lamp illuminated the room which was void of windows. Two men live inside. The compartment is ventilated by a decrepit air conditioner. Another container on the second floor houses 9 double decked beds; two at each end, while the remaining five takes up the rest of the space. This leaves the workers with a narrow aisle along the middle that is barely wide enough for one man to walk through. There are two entrances, one on each end. It is stuffy; with a ratio of one air conditioning unit to a maximum of 18 men. 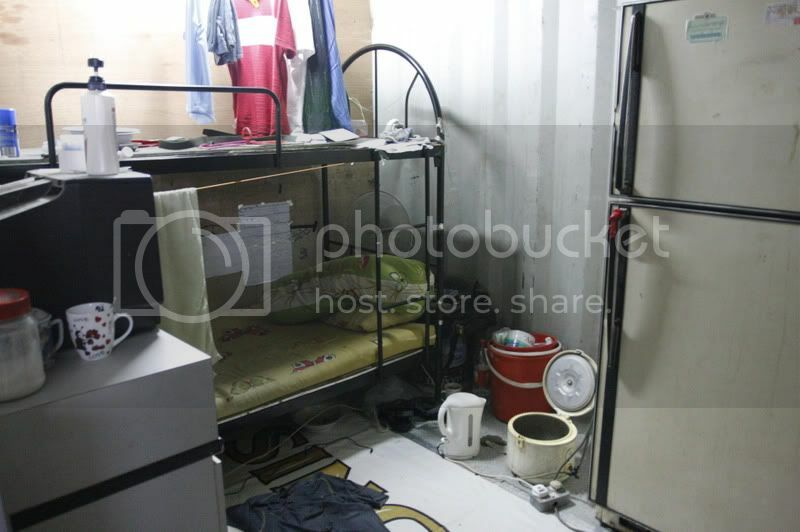 Towards the back of the compound, six Chinese workers are crammed into half a container. Junk is scattered around the compound; in between containers, behind them, and above them. There is a common showering area to a group of an estimated 30 to 40 men, and five toilets. Out of the five toilet cubicles, only three have cistern flushing systems. The toilets have no lights. The shower area has one pipe running down from a water tank. The valves that run along the water tank serve as showerheads. The men bathe by scooping water from a concrete tank. Algae cover the walls of the toilets and shower area. The kitchen; a dark, dirty, and elongated space that contains thirteen gas stoves and a similar number of rice cookers, was situated beside the shower area. Grime sticks to the zinc walls. The dormitory is a potential fire hazard. Flammable materials are strewn on the grounds. Several electrical sockets are overloaded. A makeshift ash container hangs from the side of a bunk, which suggests that the workers smoke in there. There is only one escape route. The narrow aisle in between the beds would only slow their escape. Some containers only have one entrance and exit. There is no firefighting equipment, except for one fire extinguisher. Neither were there any roads leading from the main road to the compound, which would hamper the fire rescue. The incessant presence of mosquitoes makes me wonder about the potential for a dengue outbreak. A big pool of stagnant, polluted water – a potential breeding ground for mosquitoes – is at the back of an abandoned container. In the first 10 minutes of our visit, each of us already had multiple mosquito bites. The kitchen itself is dirty, with the most frequent visitor being the flies. The potential for the spread of illnesses is also significantly higher. Those who are ill would probably not be separated from the rest simply because there is no other space where they could be isolated. In an air-conditioned environment, viruses are eminently a danger to their health. Each of these men pays S$100 every month to live here. TOC understands that the landlord leases the land from the Jurong Town Corporation (JTC). He then rents out the containers to Ocean Marine at $140 per month, per container. Ocean Marine then charges the workers $100 per worker, per month. According to the workers, Ocean Marine previously housed 20 men in each container, and the employer owned four of these containers. At $100 per worker, Ocean Marine would have collected a monthly fee of S$2,000 from the 20 workers housed in each vessel. 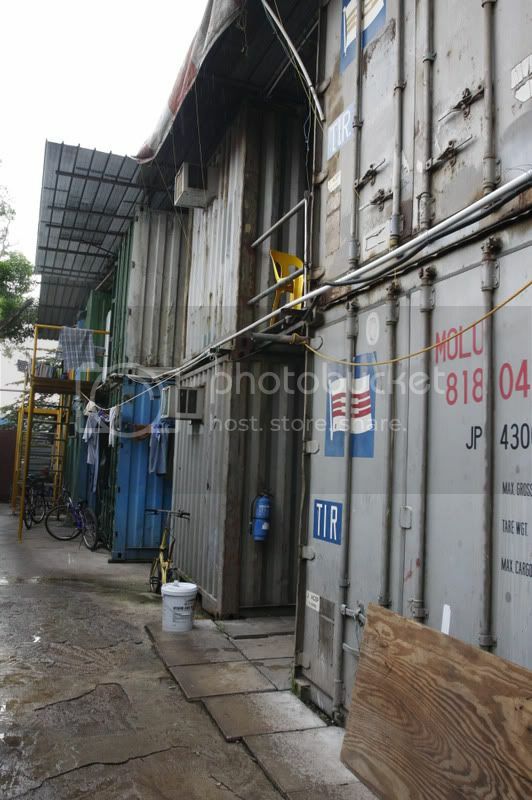 Deducting $140 for rental of each container, the landlord makes a profit of S$1,860 from each container – and an estimated S$7,440 every month from the workers who live in the four containers. The workers from Ocean Marine have since been moved out due to other disputes. There are currently other workers sheltered here. They are employed by different shipyard and construction companies. It is unclear how often inspections are carried out by the JTC. The landlord claims to have been renting the land for the last four years. Read also: The men who lived in the containers by Deborah Choo. For more pictures and a background to this story, visit TOC Facebook.